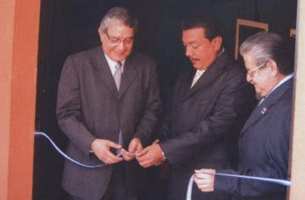 The Philatelic Gallery (Sala Filatelica) at the National Museum of Anthropology (MUNA) in San Salvador was inaugurated on 27 March 2007 by Rene Santamaria (Director of Posts), Mario Tenorio (Vice Minister of Government), and Gregorio Bello Suazo (Director of the National Museum of Anthropology). Its exhibits comprise stamps from the collection of the Postal Direction from 1867 to 1995. The initial idea is to complement this selection with more material. Besides its importance as a showcase for Salvadorian Philately, the Postal Gallery is also a meeting point for collectors, as the regular Saturday meetings of the AFISAL and the biannual auctions are also held on the premises of the MUNA.